Doesn’t look like there’s a way for them to stand in a group photo wherein their costumes would fit together in a Tetris-like fashion. 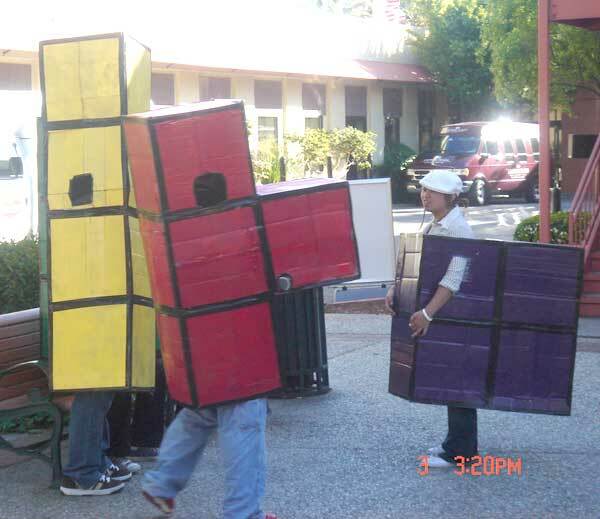 If I were making Tetris costumes, I would fashion them in a way so that they would interlock for awesome leet picture timez. Only if the yellow dude layed down, the t piece went next to him upside down and the block was next to them. Then theyed have to keep stacking until a long blue piece came along. Which, in the cosplayer world could literally be years.